No matter the size, Christmas trees have long been central to celebrating the season. I like Christmas trees – real, cut Christmas trees. I like their piney smell and their blue waxiness and the way they feel in your hand. I like the way you have to look after them for three or four weeks, and I like the way they make the holiday season seem a little special in a world that is fractious and in the thrall of money. The whole Christmas thing is a balancing act between joyful celebration and excessive consumption. And given the contemporary risk of overindulgence, it is hard to imagine a far-off day when even the most modest of celebrations were once banned. Christmas of 1644 was not the jolliest of yuletides. Lawmakers ordered that Dec. 25 “should be strictly observed as a fast,” Macaulay wrote, and that everyone must atone for past Christmases when folks were guilty of “romping under the mistletoe, eating boar’s head and drinking ale flavored with roasted apples.” All I can say is, thank heavens Cromwell didn’t live to see the Radio City Christmas Spectacular. The Christmas tree is generally viewed as a German invention that caught on in the 1840s when Britain’s Queen Victoria and her German husband, Prince Albert, gathered their family around a resplendent tree. The scene was depicted in the Illustrated London News. Readers saw a 6-foot fir tree, decked out in ornaments that would be familiar to us today, as well as the wax tapers that illuminated trees before the age of electricity and string lights. Even this regal tree was not as splendid as the ones we take for granted today. Our trees, which are farmed in upland fields, develop into handsome, bushy pyramids through summertime trimming. The very finest trees of the Dickensian age were scrawnier, but the more interesting point about Queen Victoria’s festive conifer is that it was shown sitting on a table. 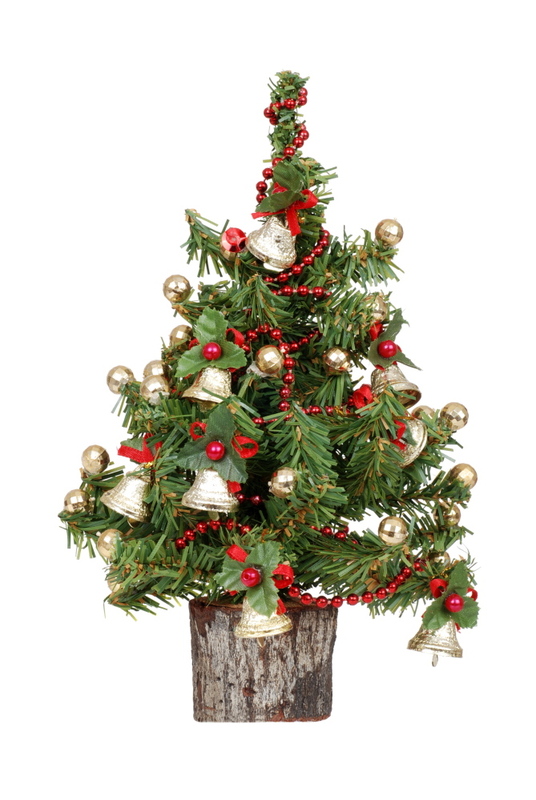 Tabletop trees – both real and artificial – are as popular as ever. They are smaller, more manageable and cheaper than freestanding ones. These attributes make them the go-to tree for singles in apartments, young couples watching their pennies, empty-nesters, people fleeing the city for the holiday and, in general, people who want to tap into the joy of the Christmas tree without going overboard. If you go to a garden center at this time of year, you might see young conifers in pots that evoke the small Christmas tree. Though festive, they will despise being kept indoors, where it is too warm, too dry and too dark for plants that are yearning for winter dormancy. They would like it on the front stoop. The other problem is that they might not work as a garden plant, if you want to keep them. One common variety, the dwarf Alberta spruce, dislikes heat and humidity and tends to grow ragged from mite infestation. Another, the Colorado blue spruce, can become in size and presence too prominent a landscape feature. The little rosemary tree will last a couple of weeks in most rooms before the ambient conditions and overwatering will cause it to die – it’s a creature for a bright, 50-degree conservatory. Enjoy it as fleeting aromatherapy. The tabletop tree seems the most virtuous: festive, demure, fragrant and honestly temporary. I wandered into a garden center the other day and found 3-to-4-foot Fraser firs for about $30. You still have to treat them as cut trees, placed in a water-holding tree stand, to prevent them from drying, dropping needles and becoming fire hazards. If that is too much to ask, artificial tabletops are available. At the Christmas Attic, a year-round yuletide shop in Old Town Alexandria, Va., the popularity of tabletop trees is measured not just in the trees themselves but also in the diminutive baubles that they need. Owner Cheri Hennessy sells artificial trees ranging in height from 18 inches to 4 feet. The latter can take full-size decorations, but anything smaller will demand scaled-down ornaments. The tabletop tree “is fun; it’s cute,” she said. “Less of an emotional commitment.” Even Oliver Cromwell would approve. Well, perhaps not.